We are aware of Michaela MacColl's imminent book and want to express our grave concern that, with this story, MacColl is violating our traditional ways by speaking of those who have passed on. She writes about two Lipan children in her book who were real and suffered terribly. Re-creating them and re-writing their story as she has is deeply hurtful to us. Indeed, the magnitude and scope of her violations are such that we will not go into detail about them. Suffice it to say that we hope that our children are never exposed in any way to MacColl's book. It is our wish that this book never see the light of day. We understand it is scheduled for release on October 4, 2016. In the strongest terms possible, we respectfully ask the author and publisher not to go forward with it. Right now, in my social media networks, private and public conversations are taking place. People are--to put it mildly--objecting to what Michaela MacColl has written in The Lost Ones. It purports to be a story about two Native children who ended up at Carlisle Indian Industrial School, and is told from the perspective of the girl, Casita. MacColl's book is due out in October of 2016 from Calkins Creek, which is an imprint of Highlights. It is in their "Hidden Histories" series, which begs a question. Who is this history "hidden" from? 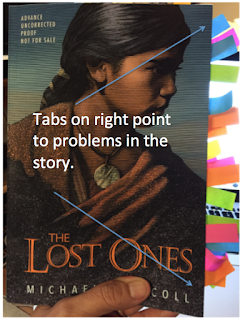 The Lost Ones is being marketed as one in which MacColl (she isn't Native) and her publisher, are doing A Good Thing. They are Saving Native People and our history from being hidden. I wonder, though, is MacColl the right person to write and tell this story? The two children in the book were real children. Does MacColl have what she needs to tell this very delicate story, with the integrity the children deserve? My short answer is no. The promotional language for the book echoes what I found in the story, too. With The Lost Ones, we have a story about Good White People Doing Good Things for Native Kids. Yuck. People may argue that MacColl did her homework. In the Author's Note, she says that she reached out to "Richard Gonzales, Vice Chairman of the Lipan Band of Texas." He met with her and in that meeting, suggested she talk with Daniel Romero, who is "Chairman of the Lipan Band of Texas." Sounds legit, right? Here's the thing, reviewers and editors, and writers, too! It can be very hard to determine if your sources are ok.
For now, let's read more in the Author's Note. In the first paragraph in the section titled "Lipan Apache or Ndé," MacColl writes that she uses Ndé in the story rather than Apache, because Ndé is what Casita would have used. That's right, but as I read the story, I saw one instance after another in which MacColl's outsider status was glaring. Using Ndé instead of Apache is an easy "fix" in a manuscript. All one needs to do is use those nifty word processing features that let you replace one word with another, in one fell swoop. I don't think MacColl did that, but when I read Casita thinking of Changing Woman as a goddess, I can't help but see MacColl's use of Ndé as superficial. Here's why. MacColl uses an outsider word ("occupied") when she says, on page 236, that "Lipan Apache occupied southeastern Texas and northern Mexico." How does a people (in this case, Apaches) "occupy" their own homeland? In the next paragraph, she writes that the Lipans conducted raids and often killed Texas settlers. She tells us that they "caused an estimated $48,000,000 worth of property damage (measured in today's dollars)" over a ten year period (p. 237). Most people reading this paragraph will be taken aback by that $48,000,000 of property damage. Sympathies will be with the White settlers. Where, I wonder, is her estimate of what the Lipans lost? Casita and her little brother, Jack, were taken captive in 1877, but there's no record of it, so she uses details from an 1873 event in which the 4th Calvary went into Mexico, destroyed several villages, and took 40 captives. Casita and Jack were taken in by "a military man and his wife, Lt. Charles and Mollie Smith" (p. 239) who traveled from base to base during the three years they had Casita and Jack with them, but for the story she chose to tell, MacColl kept the Smith's (and Casita and Jack) at Fort Clark. Because so little is known about Mollie Smith, MacColl created her as a Quaker interested in social justice, and writes that in her story "Mollie takes in two Indian children, despite the disapproval of her military husband, to prove the Quaker theory that the Indians can be tamed with kindness" (p. 239). Quite honestly--I blanched when I read "tamed with kindness." This is in the Author's Note, where MacColl could discredit the "tamed with kindness" theory (I haven't looked it up), but she didn't. She lets it stand. The back cover tells us the book will be promoted at educational and library conferences, which means they plan to pitch it as something teachers can use to teach kids about these two children. As written, the note suggests that Native peoples needed to be tamed. One could argue that the story itself is more important than the dates of when the children were captured, but would we make that argument about, say, a fictional work about Abraham Lincoln? I think not. And though the Author's Note tells us what MacColl did in writing the story, the language throughout the Note and the story itself, are ones that affirm and confirm a White perspective on Native peoples. In the note, MacColl wonders if Casita ever got to "perform" her "Changing Woman dance." Her use of "perform" is wrong. Our rituals are not performances. We wouldn't say that a girl performed her First Holy Communion, right? It is the same thing. Some of the tabs point to the places where the text reads "Changing Woman Goddess" or "the Goddess." One of them points to a part where Casita thinks "It seemed impossible that any ritual could really give someone as ordinary as herself magical powers" (p. 21). Because she is captured, Casita doesn't go through the ceremony. It is a recurring plot point in the story and is where the story ends, too, when Casita is at Carlisle. In the final chapter, a Lakota girl named Eyota is sick. The Lipan kids decide they can replicate the Changing Woman ceremony so that Casita can heal Eyota. The ceremony is described, in detail. That, I assume, is why the promotional material characterizes the story as one in which Casita tries to hold on to her Lipan Apache traditions. But there are problems with all of this! Neither "goddess" or "magical power" are appropriate! Remember in the author note, MacColl wrote about using Ndé because that is what Casita would use? I seriously doubt that Casita or her mother would use "goddess" or "magical power" and I strongly believe that the Lipan Apache people, today, would not be okay with the description of the ceremony. See, for example, a proclamation issued by the Lipan Apache Tribe of Texas that speaks specifically to ceremonies being done by the Lipan Apache Band. On page 27 when Casita's village is being attacked and she sees her mom standing defiantly with an axe, Casita "hollered a war cry" and "felt a thrill of pride; this was what it was to be Ndé!" MacColl, thru Casita, tells readers that fighting is what being Ndé is about?! That is definitely an outsider characterization! I could say a lot more about the book, but will stop. It is deeply flawed. The book includes a two-page Afterword from Daniel Castro Romero. I wonder if he read the entire manuscript? Is he ok with the story that MacColl created? Did he think it okay, for example, for her to create Ndé women who use the word "goddess"? I hope not. But, as noted above, he's the Chairman of the Lipan Band, which is doing the ceremonies that the Lipan Tribe's proclamation is about. I think that MacColl was on a slippery slope from the very start. She wanted to do something good but there was far too much potential for this story to fail. And, for me, it did. Above I noted that I might come back to the paragraph where I referenced federal and state recognition. Regular readers of my work know that I recommend that teachers look for a tribal nation's website when they are introducing a book by a Native writer to students. This creates the opportunity for the teacher to show students the website (if they've got the classroom resources to do so), making the point, visually, that we are part of today's society. Regular readers also know that I recommend that writers, editors, and reviewers look at a tribal nation's website, too, as a primary resource to help them shape/review a book. That is what I did with my review. As noted, I found the Lipan Tribe and the Lipan Band, that neither are federally recognized, and that one is state recognized. Some Native people and some tribal nations reject federal and/or state recognition as being definitive. This manifests in various ways. One example is the Haudenosaunee Confederacy and its citizens use of Haudenosaunee passports for international travel. For some time they were able to use them without any problems, but after 9/11, the United States and other nations changed their policies, and those changes meant that the Haudenosaunee's lacrosse team was not able to use their passports to travel to England for international championship games. See Passports Rejected at Indian Country Today and the Haudenosaunee Confederacy's page on Documentation. That said, it is also important that people know that tribal politics within any of our nations can be just as ugly as what we see in US politics. People who follow identity and enrollment/disenrollment news know that determinations of a nations citizenship are also very ugly. As I continue to read about the Lipan Tribe and the Lipan Band, I am finding and learning a lot. I read, for example, that one of the Tribe's tribal members won a court case about eagle feathers. That was a surprise to me, because my understanding is that federal laws state that only members of federally recognized tribes could have eagle feathers. I'll be doing more reading and research on that case in the coming weeks, and I plan to study the Anthropological Report on the Cuelcahen Nde: Lipan Apache of Texas, too. In short, there's a lot to know about the many dimensions of what it means to be a Native person in a Native Nation in the United States. It is very political, and very complicated. I think one thing, though, that is similar across all of our nations is that we protect our lands and resources. If you care about Native peoples, you ought to be following the current news about the Dakota Access Pipeline. You can start with Taking a Stand at Standing Rock, by David Archambault II, who is the chairman of the Standing Rock Sioux Tribe. Much of our culture, such as songs and traditions, are still protected today and we do not share them publicly. In his comment below, Richard Gonzales of the Lipan Apache Band said that "there are errors in ceremony and words" in MacColl's book but that he thinks it important to bring visibility to Casita and Jack. I absolutely agree with him on the need for visibility. People must grow in their knowledge of who we are today, and things our peoples experienced, historically. But I disagree with Mr. Gonzales that MacColl's book is a "good start." MacColl's way of telling the story of the two children fits smack dab in the frame of how hundreds of non-Native writers have written about Native peoples. What they've written has become what publishers expect books about Native peoples to look like. The end result of that expectation is that Native writers who submit manuscripts to publishers get rejected again and again because they don't have ceremonies in their manuscripts! The fact is, Native writers are protecting their ceremonies by NOT writing about them. Meanwhile, non-Native writers churn out books that include those ceremonies--or their imaginings of them. Based on the statement on their website, I have no doubt that if Mr. Gonzales had written this book, he would not have used "goddess" and he would not have included that ceremony, either. As it is, though, MacColl's book has the veneer of endorsement by him and by Mr. Romero. I hope that they withdraw that endorsement. Good to have seen you read the book. You critical prospective is very much appreciated and expected. It was good to have Micaela McColl reach out and write this story and spend much time in consulting with us. The book was and is not offered as a lesson on how to be Apache nor was it intended as such. It was however a means to get this story into the greater stream of readers and to incourage more research by the young. I certainly hope potential writers of our histories do get off our soap boxes and write our own stories so children and adults will have information critical to our own advancement. Yes there are errors on ceremony and words but it is an important start in this venue for our people. There is a difference in wording in Tribe and Band but that issue is of a different nature. There are Federally and non Federal recognised Indigenous nations and we respect them all however they choose to call themselves. The Tribe's reference to our ceremony is flawed on it's own merit as they were not at the ceremony and was done for other reasons. The enemy here is not us for honoring our ancestors but those who attack our history and culture. I will not allow you to drive a wedge between us instead hope we can work together. It is important that this issue of "hidden" history, stories etc be underdtood by all. Many of them had to be kept that way here in Texas otherwise, make no mistake my parents would never have achieved adult status. These stories hopefully will now have a chance to be written and published. Ms. McColl did the best job she could and our family appreciates it now let's see our own authors come out. Thank you for the excellent review, Debbie. As a Lipan Apache woman, I am reluctant to address many aspects of this book, since I'd have to discuss sensitive and/or sacred elements of our history and culture. Needless to say, I completely agree with your critique. One thing I can comment on: the stereotype that *fighting* and *war* are "what it was to be Ndé" is pervasive and harmful. It's even impacted my professional career (long story)! I shudder to think that Lipan children might read that line and internalize it. Debbie's update opens a new and vital aspect of the issues swirling around the publication of this book. I hope Richard and Daniel will reconsider their support for this "hidden history" that has already been beautifully revealed and in a good way in the documentary "The Lost Ones." And I hope the publisher is paying attention. How does one determine who is authorized to speak for a tribe or nation or ethnic group? How does one know that he/she has appropriately had a book reviewed and accepted suggestions and advice? This is a serious question, not an argument point. What are your suggestions for finding someone with a Tribe who has the knowledge and authority to speak? Are the children being written about not family to Richard Gonzalez? This is what I have read and heard. Does a person not have rights to offer contributions about family? Tribal politics can be created outside and inside the tribe. Many games can be played. Is it also fair to assume that 566 tribes must also be in "solidarity" with Standing Rock? If that were the case then you would see 566 tribal letters to that effect. Is it not political to assume that all who are Native should support that? Native people "ought" to have their own minds. I was deeply moved by THE LOST ONES and my reaction was that it continues to bring to light the mistreatment of the Native Americans by the United States government. I thought it very good because it brings the human element to the history and will touch young people's hearts better than generalizations in a history book (where the full extent of the story is not told.) Life stories mean so much more than facts when I read, and historical fiction is a great way to spark an interest in the study of history. I am sorry for the parts which are offensive and know we need to be sensitive to that, but how will others come to understand and FEEL for the Native Americans' mistreatment if the story is not told in a way which young people will read? Are the books written about Sitting Bull, Geronimo, etc. condemned? I purchased some at Crazy Horse Monument. Why do the comments above state that we cannot write about those who have passed on while the library has many books on these people. I have never studied into this matter, and so I ask these questions respectfully as one who wants to learn. Thank you for clarifying the money issue and helping me to see objectionable parts because I had not considered this while reading it. I am on a statewide committee that chooses books for school children. I have some First Nations heritage, so I've always been drawn to stories that tell of the injustices to native people. I respectfully check with this site to see what is the prevailing feeling in regards to some of the fiction books written showing the mistreatment. You've rejected many powerful stories, year after year. The pattern I have noticed over the years, is that you discount any book written by someone who is not native, (even if they have lived with a tribe, or have worked directly with descendants of the story) but there are no books written by natives that cover this topic (that ever make it to our desks). How are these children going to learn and empathize with the native plight? I don't want them to read these books to learn about specifics of a ceremony. I want them to read and realize what a horrible thing it was to take children away from their homes and put them in boarding schools, how horrible is was to not be able to speak their native tongue, not to wear what was comfortable to them. I have a friend (Crow) who has told me many stories about the boarding schools she and her children attended - I was horrified - I want my students to be horrified. We need lots of GOOD middle grade stories for them. If we keep all of these stories away from them, they will continue with their ignorance and prejudice. 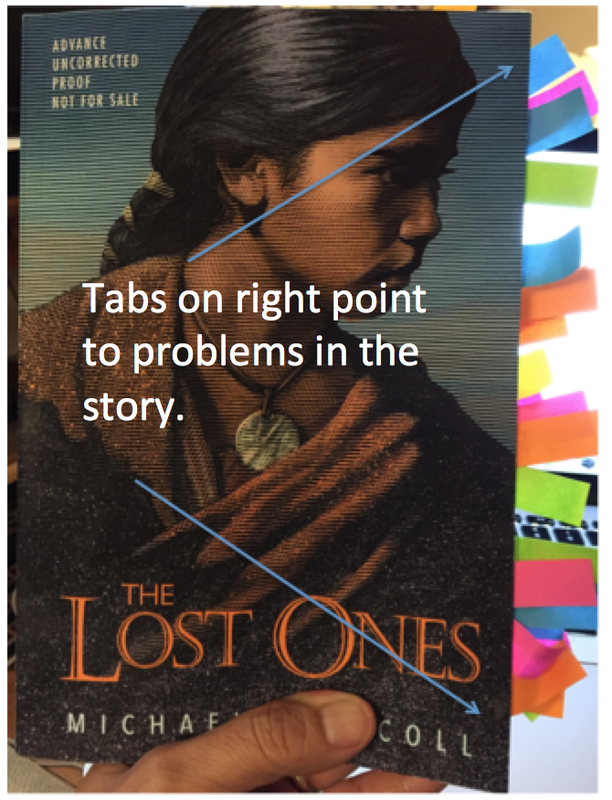 I read plenty of historical fiction and there are always inconsistencies, but I weigh out the importance of the message and whether the errors are egregious enough to detract from the message. I don't see this as a book for Apache children to read, I see it as one for white children to read, learn from and begin to empathize with. I've read many books about the Holocaust and they often refer to Jewish traditions and I am sure those, too are rife with errors, but the message is about the injustice done to people. Please help us find a way to educate these students! "Are the children being written about not family to Richard Gonzalez? This is what I have read and heard. Does a person not have rights to offer contributions about family?" posted on Monday, September 5, 2016 at 10:18:00 AM CDT, as a member of the Lipan Apache Tribe, we have many people who are of the same extended family Mr. Gonzalez claims to be from, the Castros, and there is no proof that the claims Mr. Gonzalez makes are true. You can read more on the Lipan Apache Tribe's response to this issue here especially in the notes: http://www.lipanapache.org/Museum/Kesetta_and_Jack_Lipan.html . It is urgent that when people write about claimed oral history that they, too, research what others in the community say. The author of this book did not reach out to the Lipan Apache Tribe for input.